NEXT SATURDAY (THE 27TH) IS THE ANNIVERSARY OF PHILIP GUSTON'S BIRTH. HE WAS BORN IN 1913 AND DIED ON THE 7TH OF JUNE 1980. EVERY YEAR SINCE 1998, I'VE MADE A WORK THAT COMMEMORATES HIM AS AN ARTIST. 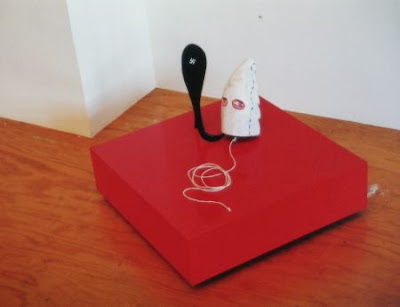 BELOW IS ONE FROM 1999 THAT WAS EXHIBITED AT JANNE LAND GALLERY, WELLINGTON IN 2000 (I THINK?). I'LL TRY AND FIND THE SLIDES OF THE PREVIOUS ONES I'VE DONE. I THINK I WILL DO A RETABLO THIS YEAR. GUSTON'S WORK HAS BEEN IMPORTANT TO ME SINCE 6TH FROM AT HIGH SCHOOL, WHEN I STARTED READING ABOUT ABSTRACT EXPRESSIONISM IN ALL ITS FORMS FROM AROUND THE WORLD. IT WAS GUSTON'S PAINTING (ALONG WITH SCOTTISH ARTIST ALAN DAVIE) THAT MADE THE BIGGEST IMPRESSION ON ME. IN EARLY 2003, JO AND I TRAVELLED AUSTRALIA TO LOOK AT ART IN SYDNEY, CANBERRA AND MELBOURNE. I SPECIFICALLY WANTED TO GO TO THE NGA IN CANBERRA AS THEY HAVE TWO GREAT EXAMPLES OF GUSTON'S LATE PAINTING, UNFORTUNATELY THEY WEREN'T ON DISPLAY AS THEY WERE PART OF THE LARGE TRAVELLING RETROSPECTIVE SET UP BY THE FORT WORTH MUSEUM IN TEXAS. ABOUT A MONTH LATER, I RECEIVED THE ROYAL OVER-SEAS LEAGUE SCHOLARSHIP THAT ALLOWED ME TO TRAVEL TO THE UK TO PAINT FOR A MONTH IN SCOTLAND. I MANAGED TO CONVINCE THE ROSL ORGANISERS TO LET ME TRANSIT THROUGH THE USA BOTH WAYS, AND THEN TO HAVE JUST OVER A FORTNIGHT LAYOVER IN LA AND NEW YORK. I MANAGED TO GET UP TO SFMOMA TO SEE THE GUSTON RETROSPECTIVE, ALONG WITH LOSING MY LUGGAGE SOMEWHERE BETWEEN AUCKLAND AND LAX. LAST YEAR AT THE MORGAN LIBRARY IN NYC, I GOT TO SEE THE GUSTON DRAWING RETROSPECTIVE WHICH WAS A GREAT REFRESHER. 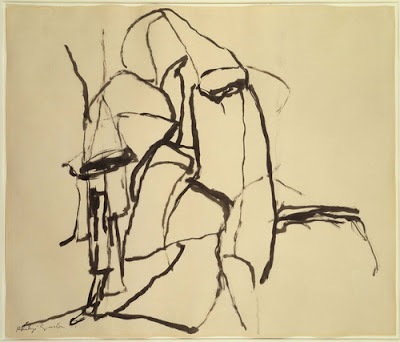 BELOW IS CELEBRATION, 1961, WHICH I THINK WAS A KNOCK-OUT DRAWING IN THE SHOW- STILL PART OF HIS AB-EXP PERIOD, BUT YOU CAN SEE THE HOODS PUSHING THEIR WAY BACK INTO THE COMPOSITION.